Hundreds of small satellites will be launched into orbit by Soyuz launch rockets over the next five years, to provide greater band width and boost internet connectivity across the world. The project would also give a billion dollar boost to Roscosmos, Russia’s national space agency. The Russian space agency, Roscosmos has struck a deal with OneWeb, to launch micro-satellites into a near-earth orbit, and spread band width for greater global internet access. The billion dollar deal, which also involves launch operator Arianespace, will see 648 small satellites, weighing 150 kgs each, launched into space by 2019. Russian Soyuz rockets will carry many of these micro-satellites. The project, which also involves Airbus, Coca-Cola and the Virgin Group, is driven by a desire to spread internet connectivity to every corner of the globe, making the earth truly a global internet village. The idea is to provide super fast broadband access everywhere, from the most remote mountain communities to the vast steppes of Mongolia. The Indian telecommunications group, Bharti Enterprises, is supporting the project. In the intensely competitive race to connect the world, OneWeb has stolen a march on Google and Facebook, both of which have said they would bring the Internet to developing countries. The OneWeb project involves the deployment of solar-powered routers to receive signals from the micro-satellites. The company also plans to provide mobile Internet access to ships, airplanes, trains and oil platforms. Some of the satellites will be launched using Soyuz cargo ships from launch sites at Kourou in French Guiana and Baikonur Cosmodrome in Kazakhstan. From 2017 to 2018, Russia will provide 21 rockets, while Richard Branson, head of Virgin Galactic, promised another 39. If all the launches go smoothly, the contract allows for at least five additional Soyuz launches after 2020, Roscosmos says. “This contract is the largest in the history of the provision of launch services,” agency head, Igor Komarov said to Interfax. 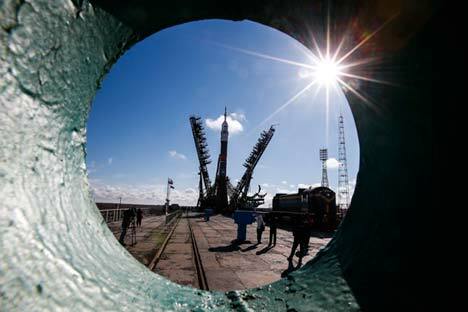 The deal could help drive the development of launch infrastructure in Russia, he added, where there was a "need for the commissioning of the new spaceport Vostochny," currently under construction Russia's Far East Amur region. A total of 900 micro-satellites will be built to fully implement the ambitious global project, the first ten of which will be assembled at a Airbus Defence and Space (ADS) plant in Toulouse, France. The rest will be put together in the U.S. at a factory run by OneWeb and ADS as a joint venture. Each satellite will cost $500,000 and weigh less than 150 kg. Conventional communication satellites cost $250 million and weigh around half a tonne. Neither international sanctions against Russia nor recent launch failures and accidents within the Russian rocket industry - the latest last April when a Soyuz rocket exploded shortly after a Baikonur launch - prevented the deal. Experts say there is a simple reason - the scale of the project. “They simply had no other choice,” Ivan Moiseyev, head of Russia's Space Policy Institute told RIR. Moiseyev recalled that one of the most recent accidents – involving Mexican satellite MexSat-1 – occurred due to a failure of the launch vehicle Proton-M, while the Soyuz remains largely reliable. “Of course, Soyuz has had problems, too, but Roscosmos is working hard to finalize modifications," he added. Moiseyev says the contract came just in time, as the Russian space industry desperately needs modernization and additional funds to ensure that both its rockets and launch infrastructure are brought up to date.